Alright, enough with the undertones of sarcasm. I want to talk about a recent report from the Bank of International Settlements (BIS – the bank overseeing all of the other central banks). During the 2000 tech bubble crash, many companies were effectively created out of thin air. Some with no sales to speak of. These companies would be considered “Zombie” companies where the interest expense on their debt far exceeded their earnings before interest and taxes. In a rising rate environment, these companies would effectively collapse as their debt payments would increase over and above their earnings. Currently, “Zombie” companies now account for more than 10 percent of the corporate universe across the developed world. That may not sound like much, but it’s huge. Many corporations are massively overleveraged. In fact, in 2018-2019 an estimated $134 billion of corporate high yield debt must be rolled over in, what should be, a higher rate environment. This 10 percent number could be much larger if inflation and rates rise. The rise doesn’t have to be large to have a significant impact on these companies. A well-known Austrian economist by the name of Ludwig Von Mises wrote about malinvestments in credit-driven booms: “The longer the boom of inflationary bank credit continues, the greater the scope of malinvestments in capital goods, and the greater the need for liquidation of these unsound investments. When the credit expansion stops, reverses, or even significantly slows down, the malinvestments are revealed.” This statement directly applies to the current state of the market where malinvestments are plentiful but aren’t shown due to the constant upward buying pressure without any thought as to what would happen to these companies if credit expansion started to slow. If credit expansion slows these Zombie companies will collapse and momentum investors will lose their shirts. I had a few people ask me recently “if inflation is rising then why aren’t we seeing a larger increase in interest rates?” Let’s take a quiz. You have $100,000 that you MUST invest in a fixed income investment. Your options are a 1 month Treasury Bill that yields 1%, a 50 year Swiss Government bond that yields 0.5%, OR a 100 year Austrian Government Bond that yields 2.1%. These are all real bond offerings. In fact, if interest rates increase 1% or more the Austrian Bonds will lose over half their value. Ok, so now which one would you pick? I think you understand where I’m going with this. Global investors are still buying US debt because it’s safer and yields more than most of the global bond offerings. Thus, prices increase (or stay steady) and yields decrease (or stay steady). Of course, this won’t go on forever. It may only take a rapid and unexpected increase in rates, or geopolitical shock, for this cycle to violently unwind. If or when this does happen the central banks will be unable to respond to the future financial stress with more stimulus if inflation is rising. Don’t assume the central banks can keep a safety net around financial markets. The markets are bigger than the central banks. The Month of October was an interesting one as it was the lowest recorded measure of volatility in history. During the month of October, I did a lot of research and talked to a very dear friend of mine who manages are very successful hedge fund in Chicago about volatility. The reason I dug into this theme is that volatility across asset classes is at mult-generational lows. 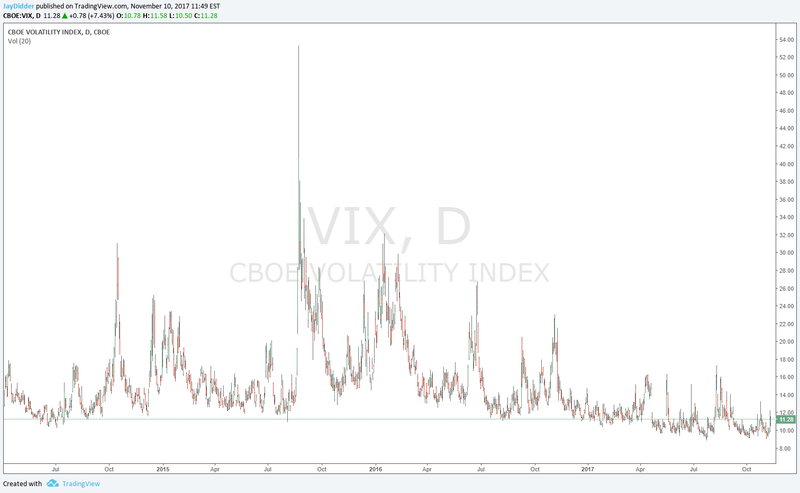 I wanted to understand how an increase in volatility would affect the current market. As I was doing some research I came across a very insightful whitepaper written by Artemis Capital Management about volatility and risk. This whitepaper surmises that volatility could be the nitroglycerin that ignites the fire. One of the most lucrative trades of the year has been shorting volatility. As an investor sees a spike in volatility they short it. They do this over and over again. Shorting volatility and deriving short incremental gains. It’s a bet or assumption that the markets will stay stable, but in exchange, the investor is also taking on the risk of substantial loss if events change and volatility increases. Artemis states, “Lower volatility begets lower volatility, rewarding strategies that systematically bet on market stability so they can make even bigger bets on that stability.” So, why should we care about this trade? “The Global Short Volatility trade now represents an estimated $2 trillion in financial engineering strategies that simultaneously exert influence over, and are influenced by, stock market volatility.” Artemis goes on to say…“We broadly define the short volatility trade as any financial strategy that relies on the assumption of market stability to generate returns, while using volatility itself as an input for risk-taking…The danger is that the multi-trillion dollar short volatility trade, in all its forms, will contribute to a violent feedback loop of higher volatility resulting in a hyper-crash.” When you chart volatility you realize that it has nowhere to go but up. Currently, there’s no catalyst to produce that upward move due to easy credit conditions, low rates, and excess supply of capital to invest in assets around the world. But, don’t get too comfortable because central banks are massively reducing their money printing efforts. Arguably the only undervalued asset class in the world is volatility. The short volatility trade is another way to provide yield to yield-starved investors outside of the fixed income world. It’s becoming an alternative to fixed income. Global money printing has created this very weird but interesting scenario, and there is a very specific occurrence that’s keeping this trade from collapsing in recent years. Since 2009, US companies have spent $3.9 trillion on share buybacks, which could be considered a massive levered short volatility position. According to the Artemis whitepaper, “In 2015 and 2016 companies spent more than their entire annual operating earnings on share buybacks and dividends.” Artemis goes on to say…“Absent this accounting trick (buybacks) the S&P 500 would already be in an earnings recession. Share buybacks have accounted for +40% of the total earning-per-share growth since 2009, and an astounding +72% of the earnings growth since 2012. Without share buybacks earnings-per-share would have grown just +7% since 2012, compared to +24%. Since 2009, an estimated +30% of the stock market gains are attributable to share buybacks.” These share buybacks are a huge contributor to our low volatility environment because large price-insensitive buyers (the companies themselves) are always ready to purchase on market weakness. Artemis goes on to say…“Share buybacks result in lower volatility, lower liquidity, which in turn incentivizes more share buybacks, further incentivizing passive and systematic strategies that are short volatility in all their forms.” This is all thanks to global money printing, which artificially depressed interest rates, which in turn allowed these companies to borrow money at historically low rates, which gave them the liquidity to buyback shares of their stock. It’s an optical illusion of growth. Back in the day, the only investors that had access to this volatility trade were hedge funds or a wall street firm trading desks. Now your grandma and grandpa can trade volatility with the overabundance of newly issued ETF’s some being leveraged products. The majority is on one side of the volatility trade. What happens when the wind changes direction and volatility ramps up? Let’s just say there will be a very large liquidity gap for those trapped in short positions. These leveraged Volatility products will have unmeasurable losses and many will be completely wiped out. Artemis believes at current risk levels, as much as $600 billion in selling pressure would emerge if the market declined just 10% with higher volatility. Over the years there has been a massive shift from active management to passive management. It’s easy to see why as passive management provides lower fees while building a diversified portfolio. According to Bernstein Research, 50 percent of assets under management in the US will be passively managed. According to JP Morgan $2 trillion in assets have moved from active to passive strategies. Here’s the problem, this huge move from active to passive will amplify future volatility. Think of it this way…active managers provide somewhat of a buffer to volatility. They step in and buy undervalued stocks when the market is falling and sell overvalued stocks when the market is rising too much. Now, remove that buffer. What do we have? We have a very small amount of incremental sellers when stocks become overvalued and we have a very small amount of incremental buyers to stop a crash on the way down. This creates liquidity gaps because that active management buffer is no longer available. I’m certainly not saying that passive management is a bad thing, but we are seeing some unintended negative consequences of this massive shift in investor mentality, which could produce higher future volatility. Volatility won’t be the thing that starts the fire, it could be the thing that pours fuel on the fire. Artemis states, “Volatility is the brother of credit and volatility regime shifts are driven by the credit cycle. When times are good and credit is easy, a company can rely on the extension of cheap debt to support its operations. Cheap credit makes the value of equity less volatile, hence a tightening of credit conditions will lead to higher equity volatility. When credit is easily available and rates are low, volatility remains suppressed, but as credit contracts, volatility rises. I hope everyone had a wonderful Halloween! My one and a half-year-old took home the gold, as she brought in enough peanut M&M’s to last me a year! If you’re interested in reading the entire Artemis Capital Management article you can do so by clicking this link. If you’re interested in receiving the Forecast Report every month, please click on this signup link.